Four of India's most senior Supreme Court judges have warned that democracy is under threat because of the way the court is being run. In the first ever news conference by sitting judges at India's top court, they said Chief Justice Dipak Misra was ignoring rules and assigning cases according to his own preferences. Chief Justice Misra has not responded. The event has prompted Prime Minister Narendra Modi to hold an emergency meeting with his law minister. "The four of us are convinced that unless this institution is preserved and it maintains its equanimity, democracy will not survive in this country," Justice Jasti Chelameswar said at the news conference, held at his Delhi home. The four judges - the most senior of the court's 25 judges after the chief justice - circulated a letter accusing Chief Justice Misra of assigning important cases selectively to benches "with no rationale", implying that he had sought to influence the outcome. In the letter, they said his role in distributing cases was to aid "an orderly transaction of business" and was not a "recognition of any superior authority". They also expressed unhappiness with "certain judicial orders" passed by the court, which they said "adversely affected the overall functioning of the court". They were going public with their concerns, they said, because the chief justice had refused to listen to them. During the news conference, Justice Ranjan Gogoi told journalists that their move had in part been prompted by concerns over the 2014 death of a lower court judge, B H Loya. He died shortly before he was due to give a verdict in the case of a politician from Mr Modi's BJP party, Amit Shah, who was accused of ordering a murder. The new judge assigned to the case ruled against putting Mr Shah on trial. Judge Loya was said to have died of a sudden heart attack. The Supreme Court is now hearing a petition calling for an investigation into allegations he was murdered. 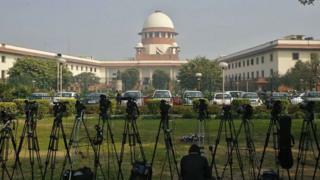 Indian media have also speculated that the judges were unhappy with the way a case of alleged corruption by a retired high court judge was handled late last year. In that case, Chief Justice Misra overturned an order made by Justice Chelameswar referring the case to the court's top judges. He justified the decision by saying he was "master of the roster". Critics said this raised concerns of interference in the judiciary and launched a petition calling for an independent investigation into the corruption charges.